General de Galerías Comerciales created the Commercial Park Las Dunas, conceived with the most advanced technology in its design. General de Galleries Comerciales has put all his experience to the service of a project that takes care of all the details in the conception of the building and the maximum nobility in the materials used for its construction and decoration. In June 2003, Grupo Vía, a prestigious real estate company, awarded the Quattrium Prize to the Promoter of the Best Commercial Center of the Year. 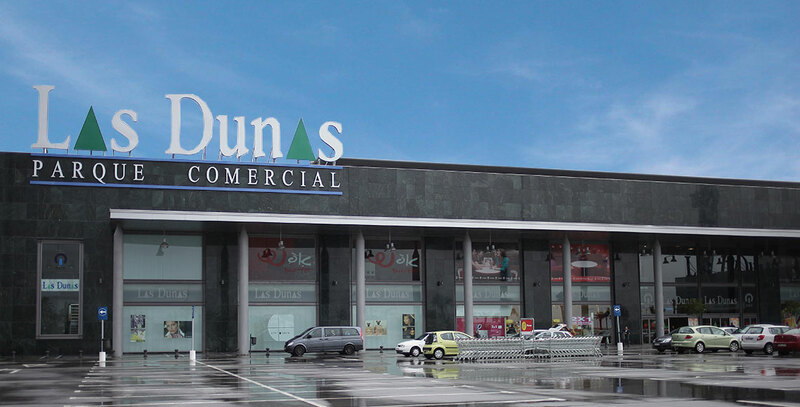 The Parque Comercial Las Dunas remains a bet for the future, as well as a consolidated present. With a revolutionary architectural and technological design, located in the great axis of the city, the Parque Comercial Las Dunas has integrated in the merchandising the best national and international firms of all the sectors, in model of the new generation of centers and commercial parks , Including leisure, catering, cinemas. A large part of these m2 are destined for the large surface area of ​​Alcampo, Sportzone,... and the rest to fashion, complements, home, decoration, sports, computers, white and brown line, specialized shops, national and international firms, Leisure and Restauration. All this supported with parking spaces and access by foot and public transport to the same commercial park.